Mindfulness is probably the biggest favor you can do for yourself. As I go deeper in being aware of awareness and witness emotions arising and settlling it’s fascinating how such a simple act of being mindful can change life without really doing anything. Simply being Mindful. I chanced upon Alfred James book on Amazon, then to his website and then to his book “Mindfulness Exercises”. The journey from amazon to the book was well worth it. Alfred turned out to be quite an authority on mindfulness. I was meant to write this review almost three weeks ago. I was so hooked onto the exercises in the book that I kept postponing it. Also somewhere I felt it would do more justice to the readers if I have had tried the exercises over a period of time. There are no difficult postures, there are no chants to be sung, there are no strict adherence to principles. None of that here. Mindfulness Exercises are as simple as breathing. If you can read the book you can do the exercises. I don’t have words to express how simple the exercises really are. Take the first exercise for instance. 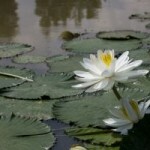 Self-Awareness – Watching the Breath of Life. The exercise takes less than a minute to give you results. Is that a good thing or a bad thing? You can decide for yourself if you consider the amount of money and time spent on psychotherapy and rest of the therapies of mind. The book’s Self Awareness exercise works at zero cost and instant speed. Funny it is that most people even though they are eating the food on their plates yet their minds are scattered at places almost everywhere except the plate or the food. Or their are bombarding their senses with bytes from TV or Internet, instead of the food. The Appreciation (Mindful Eating) – The Raisin of Life exercise of blessing the food and becoming aware of the food you eating, watching with vivid senses, the taste, the smells and colors and you can be sure the relationship between you and food will never be the same again. The experience of eating becomes a meditation in itself and an awesome one for sure. Bananas appear tastier and brighter in color. The intake of food suddenly is just as much as required. 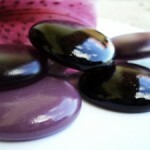 Mindful Food simply does wonders to your eating habits. In my humble view if you are struggling with food or weight problems. Do this exercise and see what happens. Alfred James Mindfulness Exercises is a little gem of a book. Priced at $8.99 it can save you a lot of money and time if you spend too much time thinking about the past and worrying about the future. If you want to enhance your practice of mindfulness, the book has interesting exercises to play with. The book allows you rest back from the endless jumping of the monkey mind and simply be an observer, aware of thoughts and emotions. That itself brings instant peace in your life as you start being mindful. Mindfulness makes living your day to day life a meditation. 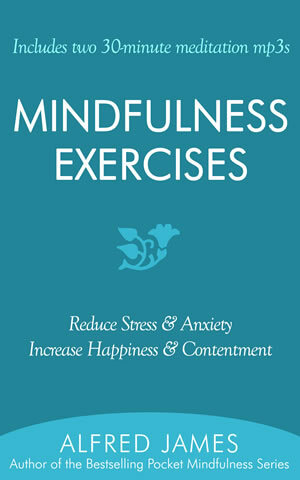 The exercises given in this book go a long way in aiding and supporting mindfulness.